In the previous post, we questioned the possible etiologies to condider. 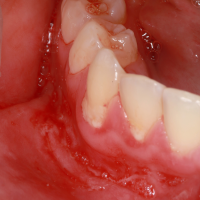 A young man, aged 18, is referred to the oral dermatology consultation Henri Mondor Hospital because of a 2 months persistent lower macrocheilia. The patient has no medical history and takes no MEDICATION. The medical examination reported severe stress episode related to the bachelor degree associated with digestive disorders: diarrhea and constipation. 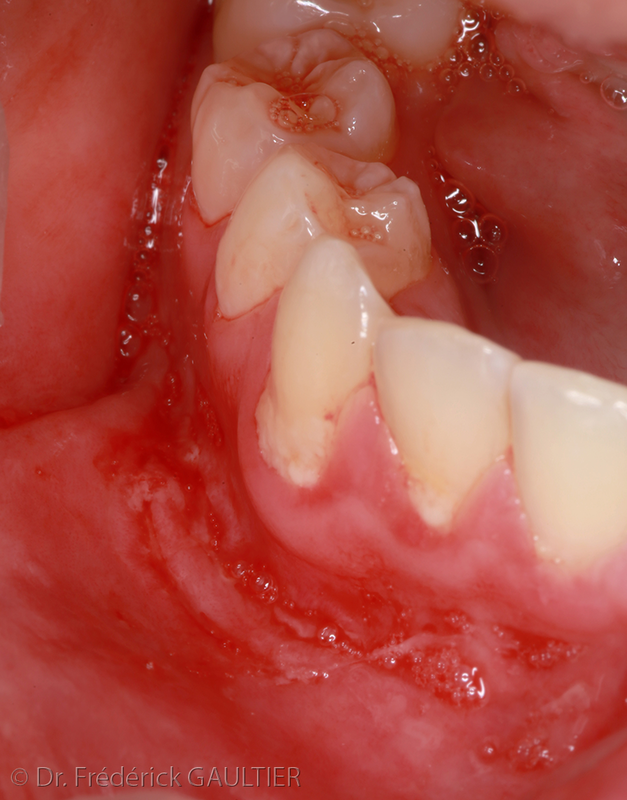 The endo-oral examination revealed : several linear ulcerations of the oral vestibule and nodules in both labial commissure and adjacent buccal mucosa. The tongue has a normal clinical aspect, as the palpation of the tumefied lower lip is painless. Monosymptomatic form (Miescher’s Cheilitis) is defined by a macrocheilitis of the lower lip (and / or upper one) associated with granulomatous without caseous necrosis. General symptoms : fever, arthralgia, erythema nodosum. Vitamin B12 deficiency symptoms : asthenia, anemia (mucocutaneous pallor, tachycardia) sensory distal disorders. Endo-oral examination: linear ulcerations of the oral vestibule and TAGs of the buccal mucosa and the labial commissure. Biological investigations : ESR, CRP (inflammatory syndrome) NFS, dosage vitamin B12 and Folates (deficiency, macrocytic anemia) anti-ASCA antibodies, colonoscopy and biopsies of colon and ileum. The patient is referred to the internal medicine service of the Henri Mondor Hospital. NB1 : the absence of caseating granuloma invalidates the hypothesis of tuberculosis. NB2 : it is also necessary to look for a foreign body granuloma (injury or trauma) and radiological examination. NB3 : the combination of Miescher’s cheilitis with Crohn’s disease, sarcoidosis or tuberculosis is regularly reported.